Anyone drawn to museums knows that the stacks, the storage space for everything not on exhibition, have an irresistible fascination. Lloyd Library & Museum, 917 Plum Street in downtown Cincinnati, capitalizes on that attraction for the exhibition “Out of the Stacks: Lloyd Inspired Artist Books” (September 28 – November 30), one of their two FotoFocus exhibitions. The second, “A Year on the Edge: A Photographic Narrative of the Edge of Appalachia Preserve,” records changing seasons in this nearby Preserve and continues on view through December 31. “A Year on the Edge: A Photographic Narrative of the Edge of Appalachia Preserve”, Photographers Rick Conner and TJ Vissing. 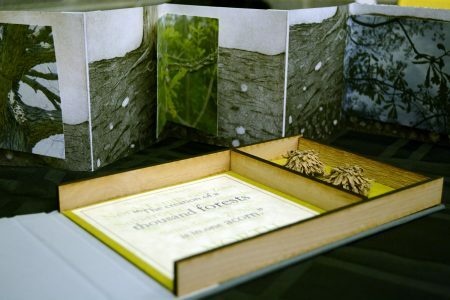 The Lloyd invited artists from the Cincinnati Book Arts Society to create artist books “evoked by the Lloyd Library’s collection” for “Out of the Stacks,” an invitation that resulted in a number of inventive works in which weeds receive the same respectful attention as their assumed betters. They are, after all, all growing things and who is to decide which are aristocrats and which the underclass? One can only think the Book Arts Society artists had a fine time delving about in the Library’s collection. They had access to the entire contents of the library (150,000 volumes of monographs and serials, nearly 3,000 linear feet of archival manuscripts and 3,000 museum artifacts). 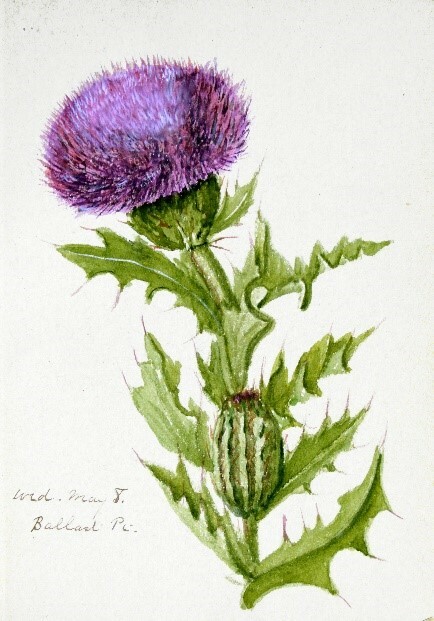 “Among the scope of sources, the artists looked to botanical illustrations by 18th and 19th century naturalists, photographs, wildflower and animal watercolor paintings and Emma Lloyd’s wedding quilt,” a caption reads. If the last item brought you up short, it did me as well. The quilt itself is part of the display, and dates from the marriage of Emma to Lloyd Library founder John Uri Lloyd in 1880. Elements of its design suggest love of nature and attracted the designers of the exhibition. The second exhibition, “A Year On The Edge,” is a fond record of seasonal goings on in the lovely Edge of Appalachia Preserve in Adams County. 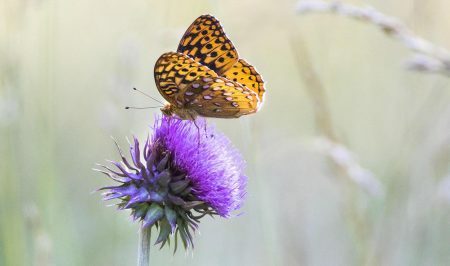 This Preserve, described as “a biodiverse natural area,” is on the edge of the Appalachian Escarpment and is shown here in photographs by Nature Conservancy photographers Rick Connor and TJ Vissing taken throughout the year. The living beings in these pictures are not humans; they are a deer (visible behind birch tree trunks), a spider on a daisy, and similar inhabitants of the natural world. It is hardly necessary to say all these photographs are in color; their celebration of nature and the wild calls out for it. The two photographers see things in individual ways. Vissing zeros in for details; Connor is interested in the bigger picture. A tall, thin photograph of a long, vertical crack in a rock with sky beyond is by Vissing as is what is probably the largest photograph in the exhibit, perhaps three feet wide, four feet high (no dimensions are posted for any of these works) – that shows a bed of moss in the late fall of 2016. Connor, as I remember, doesn’t actually show people but the deer and the spider are from him. All the photographs are inkjet archive prints. The Lloyd Library is very good at letting us see how much variety can be found within a small confine. Both these exhibitions carry on that outlook.